4.1 1. Question: Are Roman chair exercises for lower back pain safe? 4.2 2 Question: How to use Hyperextension bench or Roman chair correctly? 4.3 3. Question: What kind of exercises I can do with this roman chair? 4.4 4. Question: Can you show me a sample Roman chair workout routine? People who enjoy exercising at home to train entire core will always search “the best hyperextension bench and roman chair”. This awesome home gym equipment will help you to improve your core muscles lower back, hamstring, abdominals, and gluteal muscles. Imagine that you wake up in the morning and you feel like starting your day in a good shape. You can easily reach the roman chair or hyperextension bench to do exercises, like knee extension, spinal extension, and spinal flexion. In this way, you can prepare for summer by sculpting your belly and burning any excess fat from your body. You will not need any personal trainer or assistant for this type of exercise. In addition, you can easily follow a powerful exercise routine with the padded ankle. 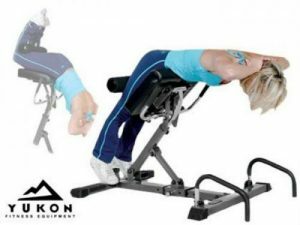 Here we have reviewed the most popular and top-rated Hyperextension bench & Roman chair models on Amazon, so make sure that you purchase the best one. The CAP Strength Roman Chair is the perfect workout tool for your home. With the help of it, anyone can have their personal gym. This perfect Roman Chair is designed to sculpt your arms, legs, core and lower back. Constructed from heavy-duty steel frame it promises a maximum recommended weight of 300 pounds so that anyone in the family can enjoy it. The CAP Strength Roman Chair features very comfortable foam padding so that you are comfortable during your workouts. The Roman Chair is very compact with dimensions of 56 x 29 x 43 inches and weighs just 39 pounds so that you can use it where ever you like. The legs and feet support is fully adjustable by height to increase the comfort and the level of difficulty of your workouts. On top of this, the legs and feet support are covered in non-slippery material. The CAP Strength Roman Chair is adjustable by length, this makes it easier to store and allows everyone to enjoy it no matter their height. There is no need to bolt it to the floor, however, if you wish to do it, the Roman Chair features holes in its feet right from the factory to make it easier for you to secure it to the ground. Pros – The main thing for which this top roman chair is one of the best is how strong it’s built. Cons– the feed has no rubber caps. For this reason, you should be careful where you place it or purchase a protective mat. The Stamina Pro Ab Hyper Bench is the perfect way to use your own body weight to work out. Using this bench you can sculpt your abs, chest, back, legs, arms, and glutes. The bench is highly adjustable with just the pull of a pin to increase or decrease the intensity of your workout. There are four positions that it can be set to ranging from flat to a 30-degree decline. By doing so you can work your middle and upper abs. The stamina Pro Ab Hyper Bench is designed with thick vinyl stitching to make it durable, comfortable and very easy to clean. With the use of this bench, you can work out your lower back muscles by performing standing exercises. The thigh support is adjustable so that anyone in the family can use it, on top of this; the foot support is designed to avoid slipping so that you can work out comfortably. The bench also features pivoting foam rollers which offer great support for your legs and feet while performing intense exercises. The Stamina Pro Ab Hyper Bench is intelligently constructed from 2” heavy duty steel so that it will easily support the weight of anyone using it. The feet of the bench is designed with rubber caps which help by avoiding slipping and they also protect your floor at the same time. The bench is fully adjustable by changing the backrest, footrest and thigh support so that anyone can use it. 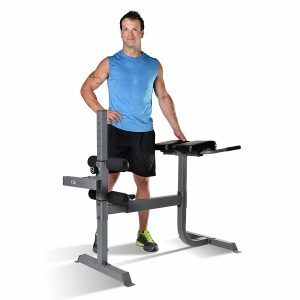 Pros – there are many pros regarding this top Hyperextension Bench as you can see in the description above. Cons – The locking pins could be designed better. They are thin and fall out if you move this Hyperextension Bench. Marcy Roman Chair is designed to perform all sorts of abdominal workouts. This product is for anyone, from beginners to athletes. The Marcy Roman Chair allows the user to extend the bench for a better workout. The equipment is designed for comfort as well. The abdominal or back area features high-density padding so that you can work out longer. The handles are padded for better grip. Adjustable leg supporters made from foam for extra comfort. Last but not least it is padded with polymer upholstery for maximum comfort while exercising. The Marcy roman hyperextension bench is constructed of high-quality materials. The heavy-duty steel frame and a powder-coated finish ensure that it will be as new for years to come. Another very important feature is the rubber caps that are attached to its feet. They protect your floor and act as a non-slippery feature as well. Pros – This best Hyperextension Bench is very compact which makes it perfect for your home. Although it is quite small, it can be used for a variety of exercises. Cons – The Marcy Roman Chair is not very suitable for tall people. If you are 6’’ tall you will have a few issues while exercising. The handles are very strong, however, they look fragile and most people would avoid using them. For people that just don’t have enough time to go to the gym and prefer to work out at home the Powerline Roman Chair back Hyperextension is the perfect solution. Using only your own body weight and nothing else you can shape your abdomen, back, hamstring and glutes. The frame is constructed from 2” x 2” steel and the base is wide enough so that there is no rocking. This Hyperextension Bench finish of powder coat applied electrostatically serves as a very efficient way of helping the product last for a lifetime. The Powerline Roman Chair measures 36 Length x 46 Width x 25 height inches when assembled which is not too large so that it fits in your house but large enough so that any member of the family can enjoy it. Like most products of this kind that are designed to be used indoors, it features rubber caps attached to each ending of its feet to protect your floor and avoid slipping. Pros – Very sturdy equipment. This Roman Chair is designed with high-quality materials that will last for years to come. Cons – The mid-section pads are small and it would have helped if they were round. It does, however, have a gap for men to be comfortable. The ankle pads are short and there is not a lot of support for this reason. Also, the pads fall off with the least amount of effort and you always have to be careful while exercising. The handlebars are also quite short which can be an inconvenience for some people. Yukon Total Hyperextension Bench is designed for extra comfort featuring high- density foam, top-grade vinyl covering to make it as comfortable as possible when working out. Its weight capacity is 300 lbs. It also features fold away handles for extra assistance and dual handles for stability and flexibility which helps to relieve back pain. This Hyperextension Bench uses your own body weight and nothing else to shape your body. Exercising with this Roman Chair will help you to sculpt your glutes, hamstrings, back, hips and abdomen. This product is constructed from heavy-duty steel frame so that anyone can concentrate on exercising without having to worry about breaking something. This hyper back extension bench also features tricep handles along with a wide area base for extra support. The handlebars feature molded hands for extra grip. The feed of the chair feature rubber caps to avoid slipping and to protect your floor. Pros – This Best Roman Chair is very well designed using minimal features but allows various exercises. On top of this, the best thing about it is how strong it is constructed with no apparent weak points. Cons – The chair is adjustable by height but not by length. This, however, should not be a problem since the chair is quite large. Another best roman chair is XMark Roman Chair. Thanks to this professional grade training equipment you can increase your core strength, improve your lower back, shape your six-pack abdomen like you always wanted, improve your posture and many more. This Roman Chair features a very well made design, a wide base, and adjustment on 10 levels which provides a lot of comforts and plenty of stability while exercising. With this product, you can let your imagination go wild and perform all kinds of exercises such as hyperextensions for your back and abdomen, side bends, sit-ups and tricep dips. To assemble it all you need is the user’s manual and a spanner, it will be up and ready in a matter of minutes. The chair weighs just 66 pounds but for your convenience, if you wish to move it around it features two wheels. The handlebars are just the right size to hold onto while performing your exercises. The rubber caps on the feet of the chair protect the floor and avoid slipping. Pros – The best thing about this Roman Chair is the structural integrity. The materials used give it a very sturdy feel, even for people 6’ and over with just under 300 pounds have no issues in using it. Cons – The chair is adjustable by height but not by length. However, this should never be a problem for anyone since it is quite large. There is a wide variety of models of Hyperextension Bench out there with less or more functions and course at different prices. Be careful since a poor quality model can be dangerous to use. Here are some guidelines for buying a Roman chair Hyperextension Bench. Before buying any product always try to read about the customer reviews whether they are happy about the product or not. It must be made from sturdy and high-quality materials. If the bench is heavy, that is a good sign. If this Hyperextension Bench wobbles, forget it! You cannot focus on your workout if it wobbles or makes sound, and it is also dangerous. This roman chair hyperextension bench must be comfortable. The midsection and also the feet pads must be covered with durable, thick foam or other materials. Make sure the size of the roman chair model you want to buy so that you have enough space to exercise. The roman chair must be adjustable. It is very important to practice the moves correctly which is only possible if the machine can be adjusted according to your height. You should check the warranty of the product so that you can use it for long period of time. Always keep in mind that a cheap product in most of the cases will cost more and give you lot of Hassel in the long term. So try to choose the best Best Hyperextension machine for better service. There are several blessings of best roman chair hyperextension bench. To start with, it’ll assist you to develop your posture. The best hyperextension bench exercises will facilitate your muscles stretch, enabling exercises that you simply don’t do in your daily routine. Working out your lower back muscles will guarantee that your body position remains upright throughout the entire day. Any back pain will be minimized or perhaps eliminated by this hyperextension bench exercises. Usually, muscle pain is as a result of not exercising and it is a stress for many people. Even though you have muscular pain from exercising it means that your body is functioning, so you need to continue working out. Your entire body will be carven, even though you would possibly not feel it. When following a fitness routine you will feel your muscles during any exercise. Over time you will observe how your legs, back, and abs improve while exercising with the roman chair and hyperextension bench. Working out and eating good food especially plant-based food will surely boost your health and longevity. Your physical performance will improve and you won’t get tired as quickly as you are doing currently. You will be able to run quicker, throw objects further and breathe easier during working out since your body will get used to hard workouts. A very good thing about this best roman chair is that you can easily customize and regulate it as you want and that helps to do the best roman chair workouts. It is excellent for folks of any stature (both tall and short) and it can be used by anyone in your family. You can store it anyplace since it doesn’t take too much area. 1. Question: Are Roman chair exercises for lower back pain safe? Answer: If you don’t have lower back pain yet, then the roman chair is a great prevention for the lower back problem. If you already have back pain, then it can help but always consult with your doctor before. If you have a serious issue regarding the lower back problem, it might do more harm than good. 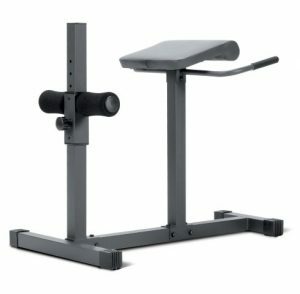 2 Question: How to use Hyperextension bench or Roman chair correctly? Answer: Haven’t you use this fitness machine before? For the lower back, the hyperextension bench exercise is the most beneficial. Learn here how to use Roman chair correctly! 3. Question: What kind of exercises I can do with this roman chair? Answer: You can perform different Roman chair exercises such as abs exercise, sit-ups, leg raises or oblique moves. And if you want to add an extra boost to your exercises using a Roman chair hyperextension bench then get a medicine ball or dumbbells for extra resistance. This way you can set up a complete Roman chair hyperextension bench workout to train your entire core. 4. Question: Can you show me a sample Roman chair workout routine? Answer: Here are some roman chair workout advice for you. At first, your main focus should be on complete core training that means first you have to strengthen your lower back/spine, upper/lower abs, and your obliques. According to your fitness level do this plan 2-3 times a week. When talking about the best roman chair there are many factors to take in consideration. Each product is designed for different kinds of people and various exercises types. When shopping for the best hyperextension bench you should always check the reviews from people that have already used the product to because the pictures don’t explain the experience as much as they should. The main thing to look for before buying is the size of the product and adjustability to your needs. Another thing to think about is pricing, you may have a budget in mind but consider spending just a bit more so that you can enjoy a well-made product.